When I am not selling Real Estate in Idaho Falls with Copper Creek Homes and The Group Real Estate as The Bearded Realtor. I love keeping a saltwater fish tank. Ask any saltwater aquarium hobbyist and you’ll discover that the process of setting up and stocking an aquarium is definitely worth the effort and the wait. Saltwater aquarium set up and stocking requires proper planning, especially now that the internet has afforded hobbyists access to many more species of fish and invertebrates. Many of the available species may also have special compatibility requirements which you must address during the stocking process. 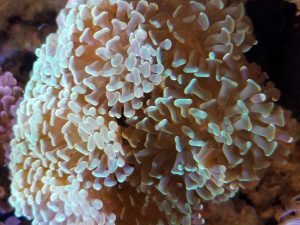 This article details the five phases involved in successfully setting up and stocking a marine aquarium. Step one is prepare your aquarium water. Set up the aquarium and install all filtration equipment. Fill the aquarium with fresh water that has ideally been processed through reverse osmosis. (If you must use untreated city water, add a quality de-chlorinator to remove chlorine from the water.) Next, add salt by carefully following the instructions on the salt mix. Use a hydrometer to monitor and raise salinity to the desired level. Install the aquarium heater and set to the desired temperature. Allow the system to run for a few days to ensure a constant water temperature and proper operation of all equipment. Step two, build your aquarium foundation with live rock. After your aquarium has run successfully for a few days, start building your “foundation” of aragonite-based substrate and live rock. You might also consider adding 2-3 inches of live sand, which seeds the sand bed with beneficial bacteria and micro-organisms. After you’ve added your substrate and live sand, add your properly cured aquarium live rock. In addition to harboring large amounts of beneficial bacteria and micro-organisms, live rock also provides aquarium inhabitants with safe hiding spaces and helps maintain healthy water parameters. Live rock offers aesthetic appeal and biological filtration while providing the necessary habitat and nutrition for your fish and invertebrates. You can choose from several varieties of live rock, it has variations in color and shape. Add to the natural aesthetics of you marine aquarium. As a general rule, add approximately 1-1/2 pounds of rock per gallon of water in your aquarium. The exact amount you should add will vary by the type of rock you choose. Be sure to follow the recommendations that accompany your chosen live rock. Your live rock must be fully cured before you can add any fish or invertebrates to your aquarium. The curing process, which initiates the Nitrogen Cycle, typically takes 4-5 weeks. During this time, you must also perform weekly 25% water changes. To start your live rock curing, stack the rock loosely in your aquarium. Try to build as many caves as possible. This allows fish to swim freely within the rock work, and provides the rock with good water circulation. Also, be sure to stack your rocks right side up – turn the side of the rock with the most color upward. 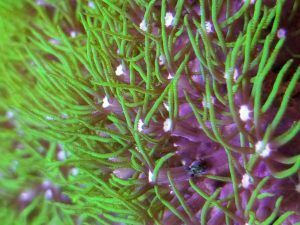 This will help ensure proper lighting conditions for both the colorful coralline algae, which requires bright light, and the sponges, which require low light. Please note: during the curing process, you must keep the aquarium dark to inhibit algae growth – provide illumination only briefly when checking progress. Step three add lighting and an algae pack that you can buy from a local pet store. Once your live rock has fully cured, and the biological filtration is mature, you can begin stocking your aquarium. However, as a final precaution before stocking your aquarium, test your ammonia and nitrite levels to ensure they are at 0 ppm. At this time, you should also set up your lighting system with a timer set to illuminate the aquarium 10-12 hours per day. The following few weeks after adding lighting, you may experience an algae bloom. To combat this, you should add an algae pack to your aquarium. The biological filtration will quickly accommodate the new inhabitants, due to the fully cured live rock in the system. After a few days, test the ammonia and nitrite levels – when they reach 0, you can begin adding fish and invertebrates. Step four, begin adding fish and invertebrates. After you’ve cured your live rock, illuminated your aquarium, and taken care of any subsequent algae blooms, your aquarium is ready for fish and invertebrates. Before adding any fish and/or invertebrates, be sure you’re familiar with any compatibility issues that may exist among your desired species. Also, be sure to stock your aquarium gradually to allow the biological filtration to catch up to the new biological load. When planning your initial and additional aquaria orders, first test ammonia and nitrite levels and make sure the levels reach and remain at zero for at least a few weeks. Once the levels are stable at zero, you can safely order – then add – new fish and/or invertebrates. If you’re not already familiar with the temperament, environmental requirements, and maintenance/aquarist expertise level of your desired species, LiveAquaria.com offers helpful, concise quick stats with that information for each fish and/or invertebrate. 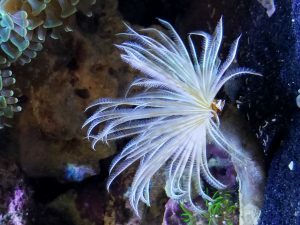 LiveAquaria.com also offers a comprehensive compatibility chart to help you determine whether your desired species are compatible with one another. The first series of fish and invertebrates you add to your aquarium must be the most docile of your desired species. This will allow them to become accustomed to the aquarium before you add larger, more active, more aggressive species. After giving your new arrivals at least a few weeks to become acclimated, follow up gradually with the larger, more active species. You may also be wondering just how many fish you can successfully keep in your aquarium. While many variables affect that answer, a general rule is to stock no more than ½ an inch of fully grown fish per gallon of water in your aquarium. For example, if you have a 30-gallon aquarium, ideally stock no more than 15 total inches of fully grown fish. Remember to consider your desired fishes’ maximum size when calculating this amount. Step five is adding a cleaning crew or attack pack. Now that you’ve established your aquarium and added fish and invertebrates, you should add a cleaning crew to help maintain healthy water parameters. The invertebrates in these attack packs feed on leftover food and waste from fish and other invertebrates. If insufficient detritus-eating invertebrates are present, the unconsumed food and waste will ultimately serve as nutrients for unwanted algae. Simply choose the cleaning crew that fits the size of your aquarium. In conclusion the above steps should simplify and demystify the process of successfully setting up and stocking a marine aquarium. Most importantly – and prior to investing in and setting up aquarium equipment – research the needs of your desired fish and invertebrates to ensure from the start that you have the time, energy, and resources to invest into their care. And be sure to resist the temptation to add all your inhabitants at once – by stocking your aquarium slowly, you will greatly increase your inhabitants’ chances for survival, as well as your chances for long-term success. With the proper setup, as well as diligence, patience, and care, your saltwater aquarium and its inhabitants will thrive while you enjoy a beautiful, fascinating ocean setting in your own home.